This year the Parish Council was very proud and delighted that for a second time they have lifted the Shropshire Association of Local Council's Jan Snell Award for Community Achievement. 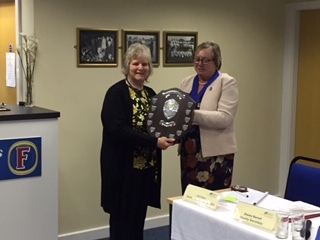 The Award was presented to the Clerk, Freda Morris by SALC President, Katrina Baker MBE (pictured below) at SALC's AGM in November. The President spoke of the Council's exceptional project to purchase a derelict pub car park and bring it back into uses as an excellent, much needed parking facility for the Doctor's Surgery opposite and for community parking outside of surgery hours. The project was not without some major problems and legal issues. However, due to the determiniation and persistence of the Clerk and Councillors and many additional hours of work and extra Council meetings over a period of 8 months, the project was finally completed. The Council first received the award 10 years ago for a year of outstanding achievements that included recognition as a Quality Council, the Clerk gaining the Certificate in Local Council Administration, the building of 6 affordable houses following a hard council campaign, the provision of parking spaces for village use and many more. 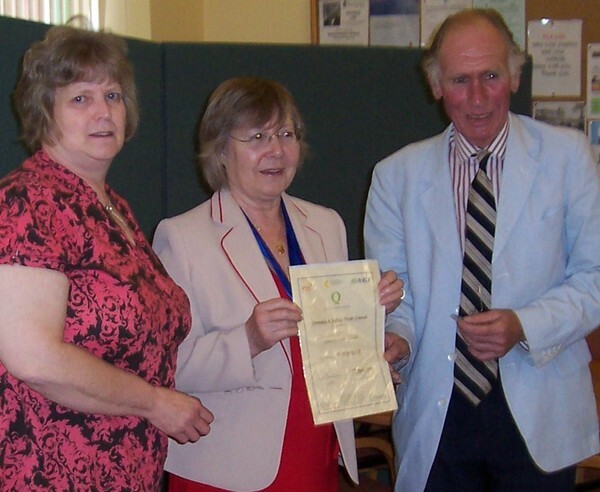 Pictured below is the Clerk receiving the Quality Council award in 2008.